Short mic stand with tripod leg base and fixed length boom, plastic base. Tall mic stand with tripod leg base and fixed length boom, plastic base. 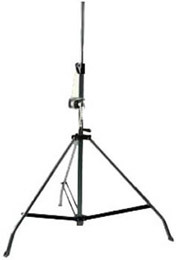 Rugged tall mic stand with reliable cast alloy tripod leg base and fixed length boom with new locking system. Rugged tall mic stand with reliable cast alloy tripod leg base and telescopic boom with new boom swivel. Black painted aluminium speaker stand with pin safety system. Speaker stand with steel construction to support heavier loads featuring a safety collars incorporating a lock seal and a security pin to avoids sudden drops. Fully adjustable, it folds down for convenient storage and transportation. Available in black or chrome. Aluminium speaker stand with a tightening block clamp system and air-damped safety device for extra safety. This compact design allows easy positioning while in use. Available in aluminium or black finish. Aluminium speaker stand supplied with a lock clamp system, a steel security pin and air-damped safety release to allow maximum flexibility for quick and easy operation of portability. Available in aluminium or black finish. Professional heavy duty tripod style stand with folding legs for easy transportability. Extremely stable, height adjustable with spring-loaded pin and safety locking screw. Available in zinc-plated finish. This wind-up lighting and speaker stand features a heavy duty steel construction that makes it particularly suitable for louspeakers. 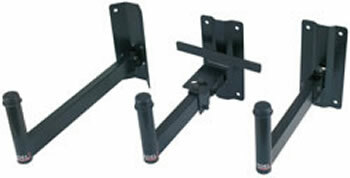 Supplied with aluminium feet, double brace legs for an extra structural support and die-cast aluminium joint sections. Heavy duty speaker wall mount stand for corner installation. Directional mounting bracket allows the speaker to be adjusted vertically. Heavy duty speaker wall mount stand with safety rear brace. Directional mounting bracket allows the speaker to be adjusted both horizontally and vertically.